In 2015 world leaders came together and made a historic promise. They signed up to 17 Global Goals – the Sustainable Development Goals – that have the potential to end poverty, to reduce inequality and to tackle climate change in 15 years. Examine: provide new data on who is at risk of being left behind, why and where; we will put a spotlight on the most marginalized groups and monitor progress on reaching those furthest behind first. Engage: people all around the world, including civil society activists, world leaders and the wider public, through the creation of compelling content and telling the stories of those who are being left behind. Empower: those who are currently at risk of being left behind and who may be marginalised to be able to speak for themselves. We will work with partners in at least 30 countries to build local voices for action and accountability. Everyone deserves a fair opportunity in life to realize their full potential. But many people are denied this right because of who they are or where they live. The LNB partnership will be carrying out research to identify in more detail who is being left behind as this varies widely across and within countries. Despite impressive progress in some parts of the world, an estimated 1.2 billion people remain in extreme poverty (under $1.25 day) . 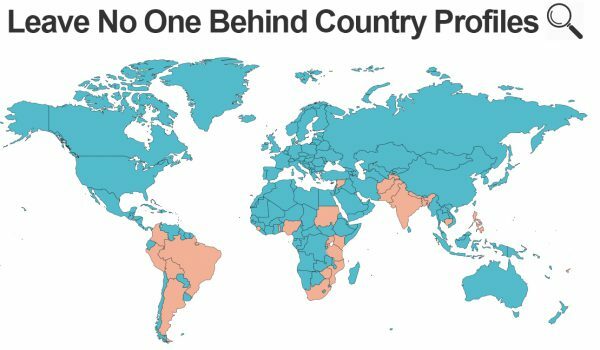 Fragile and conflict-affected countries typically have the highest poverty rates and in the future, extreme poverty is likely to be concentrated in fragile countries. Poor and excluded people face daily exclusion, violence and discrimination because of their social characteristics. However not all exclusion is poverty related – people can face discrimination and limited opportunities because of their social characteristics across all income groups. Girls and women often face multiple and overlapping deprivations, harm and exclusion. In sub-Saharan Africa, only 23% of poor rural girls finish primary school. Worldwide, one woman in every three will experience violence in their lifetime. Children continue to face unacceptable levels of harm, violence and exploitation. Every five minutes a child is killed by violence . 5.5 million (26%) of forced labourers are below 18 years . Nearly 90% of the world’s 1.8 billion young people live in developing countries. Over 500 million young people, aged 15-24, live on less than $2 per day. 80% of world’s older people will live in developing countries by 2050 . The number of people aged 60 years and older in sub-Saharan Africa is projected to reach 67 million by 2025 and 163 million by 2050 . Many older persons all over the world face continued discrimination, abuse and violence. People with disabilities face significant levels of discrimination and stigma and are less likely than others to be able to move themselves out of poverty . People living in poverty are also at greater risk of experiencing disability due to higher risk of malnutrition, disease, lack of access to health care, water supplies and sanitation and worse living conditions. People with mental health impairments and intellectual and psychosocial disabilities face unique and complex challenges that are not widely understood or addressed. Adults with mental health conditions are almost four times more likely to experience violence than people who do not have a disability. Members of ethnic and religious minority groups are more likely to be poor than people from majority group/s . Discrimination against Lesbian, Gay, Bisexual and Transgender people is widespread. Homosexuality is currently criminalised in over 70 countries including 40 of 53 Commonwealth member states. Disparities between rural and urban areas remain pronounced. Poverty is still predominantly a rural phenomenon and will remain so for at least the next two decades . Remoteness limits productive economic opportunities and is often linked to discrimination against minority groups . The proportion living in under-served urban areas is likely to rise with increasing rates of urbanisation. Crisis-affected populations, refugees and migrants can face additional multiple deprivations and exacerbated risks of discrimination. Over 125 million people are estimated to currently require humanitarian assistance, including over 60 million refugees who were forced to flee their homes because of conflict . Globally, about 21 million people are trapped in forced labour or modern slavery. What does the LNB Partnership do? Leave No-one Behind is a fundamental commitment of the Sustainable Development Goals, which have a 15-year timeframe, from 2015-2030. To support the early stages of the Leave No-One Behind commitment, and to make sure it gets off to the best possible start the partnership currently runs between July 2016 and March 2017. An independent international development organisation that focuses on the role of data in driving poverty eradication and sustainable development. The organisation is a leader in promoting better and more transparent data for development, including helping establish the multi-stakeholder International Aid Transparency Initiative (IATI) and holding the role of technical lead on its Secretariat. Lead on the EXAMINE strand. DI will produce and socialize new data relating to ‘leaving no one behind’ to put a spotlight on the most marginalized groups and arm all development actors with the data they need to track the progress of the poorest and most marginalised people. A specialist creative organisation which set out to popularise the launch of the UN’s Global Goals for Sustainable Development in 2015. They reached the masses through the iconic branding of the Global Goals, a text sent to 925 million people, radio programmes in 75 countries, and helped deliver school lessons about the goals to millions of school children. Lead on the ENGAGE strand. Through creating compelling creative content, telling the stories of those left behind they will help build greater awareness of the Global Goals and the pledge of ‘leaving no one behind’. A global alliance of civil society organisations and activists dedicated to strengthening citizen action and civil society around the world. The organisation has considerable experience facilitating multi-stakeholder partnership, including its previous roles as host of the Global Call to Action on Poverty (GCAP) and Action/2015. Can others join the LNB partnership? To turn the LNB promise from words to reality we need everyone. That’s why the partnership is focussed on catalysing sustained action, commitment and responsibility from the global system, (governments, private sector, UN, international organisations and citizens). Use the tools: Everything –from data to campaigning tools created through the partnership is designed for anyone to use. Take Action: The partnership will run advocacy and awareness campaigns and initiatives generated in partnership with others which members of the public will be encouraged to take part in. Take part in a national dialogue: In an effort to identify the communities and groups of people most in need of access to the resources and programmes that can deliver the LNB promise, , CIVICUS is conducting National Dialogues in 30 countries with civil society groups that work with and on behalf of the most marginalised and disadvantaged people, especially those living in impoverished communities and who are at high risk of violence and discrimination. As part of the process of National Dialogues, there is an interactive survey, you can find information on the survey and key countries to be included here. Support the LNB partnership: we hope that the first six months of the partnership will act as a catalyst to expand the range of partners and help mobilise wider support over time from other civil society networks, donors, member states, UN agencies and private philanthropists. If you are interested in coordinating national activities for Action4SD, we suggest organisations complete a national-level stakeholder mapping exercise to identify civil society actions that are already making a meaningful difference on the themes related to the Sustainable Development Goals. To undertake this scoping activity, please download the national template (word document). Josephine and Cecilia left home to escape early marriage and Female Genital Mutilation. Through education they are working to change their lives and those of others. Eunice and Josephine had to leave their jobs working on flower farms in Kenya. They struggle to find work and they and their families often go to bed hungry. Tracy lives in one of the poorest areas of Nairobi. She joined a youth orchestra which helped support her education. She is now a vocal advocate for girl’s education. More videos related to the Leave No One Behind pledge and the Sustainable Development Goals available here.